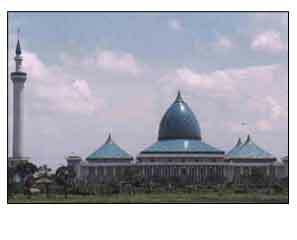 Located at Pagesangan near by the Surabaya - Gempol highway (south Surabaya) and up till to date it is the biggest mosque built with the modern unique architecture and many visitors arived at Sunday or at halidays. There are a dawn market in front and arround the mosque, selling the consumer goods, food & beverage, house hold, toys, clothes and anything else. It's very easy way to reach this mosque weather by the private vehicle nor by the public tranportation and inaugurated by the president of Indonesia Abdul Rachman Wachid on November 10, 2000 and named Al Akbar Mosque.